Greece and its surrounding islands have always been alluring to Manisha Kothari. When she heard that Vani Subhash was organising an all-ladies trip to the country, she jumped on the opportunity to visit the place, even though she had never met many of her fellow travellers. On May 3, a group of 23 ladies ages 40-70 and from different walks of life landed at Athens International Airport. Their first destination was Thessaloniki, the second largest city in Greece. It is also the capital of Central Macedonia, a region with great historic importance which was once at the crossroads of many civilisations and cultures. Here, they were joined by their tour guide Maria. Manisha was the youngest of the lot, travelling in a big group for the first time. “I have never travelled with such big group. I didn’t expect the experience to be nice and exciting. I didn’t know how to get along with strangers until now, but we just got along. There were people from different backgrounds, age groups and professions. I’m a jewellery designer, but there was also a gynaecologist, a teacher and a businesswoman, and most of us were meeting for the first time,” said Manisha. After resting for a while on the first day, the group began their tour with a small walk to the centre of the city later in the evening, where they dined at a Greek restaurant. After an early breakfast the next day, they began a full-day tour of Pella and Vergina. An hour’s drive from Thessaloniki, Pella was the ancient capital of the Macedonian Empire and the native town of Alexander the Great. “The bus ride to Alexander’s birthplace was beautiful. The place has so much history that’s well-presented, either through archaeological sites or the museum. The people are quite warm and friendly here,” said Chandini Bhoopal, a teacher who fell in love with the monasteries of Meteora on their third-day tour to Kalambaka. 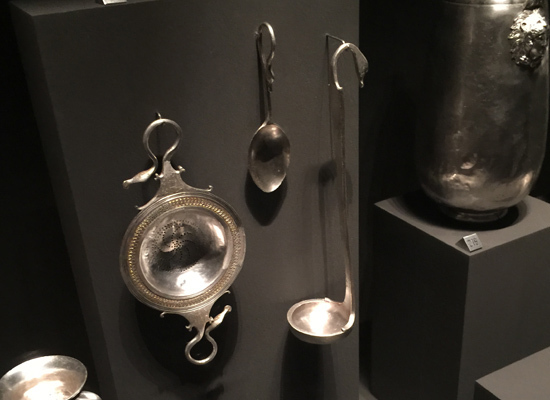 The museum was a window to discovering interesting findings from the 4th century BCE. A unique statuette of a horned Athena, an adorable sleeping Eros, and a statue of Alexander sprouting the horns of Pan are from this period. After the museum visit, they drove to Vergina, one of the most important archaeological sites in Greece, which is listed as a UNESCO World Heritage Site. Later, they toured the White Tower and Thessaloniki’s rotunda monument. 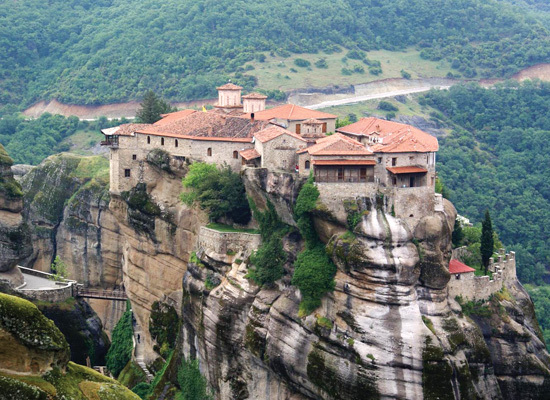 The visit to Kalambaka and the astonishing Meteora left the group in awe. “I fell in love with the natural beauty of this place. It was so peaceful. They have monasteries and a small village on the steep rocks,” said Manisha. Perched on the hills of Meteora, this place is known for its monastic community, whose foundation was laid by a group of early monks who climbed these steep slopes and stay here. One can also find some of the most beautiful spots for amazing views and photos here. For the next two days, the group visited places like the Temple of Apollo in Delphi, and they passed through the Thermopylae pass, where 300 Spartans fought the massive army of Xerxes. They relived the history in Athens at Panathenaic Stadium, where the first modern Olympic Games were held. The group’s last destination was Santorini, a crescent-shaped island in the Aegean Sea. 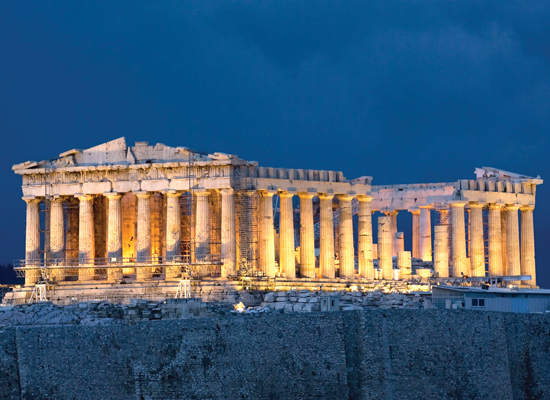 It’s perhaps the most fascinating and most talked about island of Greece. “It’s heaven on earth, one of the most beautiful places I’ve been to. It feels as if it’s coloured with blue and white,” said Manisha. 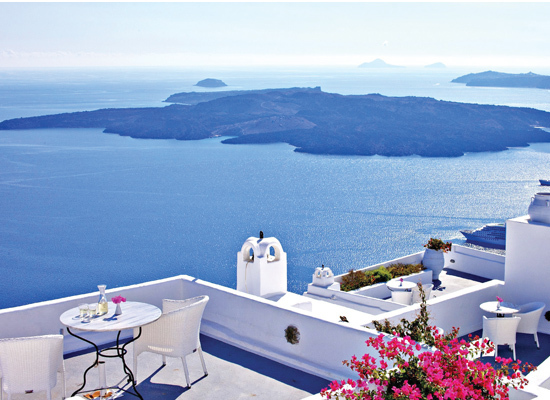 Santorini is known for its stunning sunsets, and nearly every house has beautiful view of the sea. The group also sailed to the nearby lava island of Nea Kameni, got an opportunity to swim in the hot springs, and explore the port of Santorini. The group returned from their trip with many memories and experiences to talk about. Manisha was touched by the people of Greece, especially the guide who took such good care of the group. “Maria touched my heart and looked after us all the time. The way she spoke to me and all the things she told me have changed my outlook on life. But the beauty of the trip was that I got to meet a variety of people whom I otherwise would have not had a chance to meet, even while staying in the same city,” she added.